Meet Pepe. 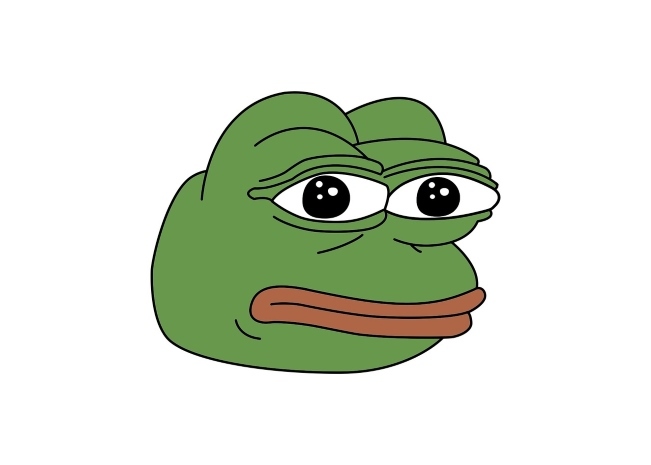 Pepe is a frog. It’s okay; he knows and he’s fine with it. Pepe the Frog, not to be confused with Pepe Le Pew (they hate each other), is a laid-back frog who was born in a mud puddle after the harsh rains of a hurricane. No “lily pad” upbringing for Pepe, strictly mud puddles and Florida heat. He never knew his parents; Pepe grew up on the streets, scrounging for bugs any way he could. He’s been kissed by a lot of drunk girls who believe he might be their Prince Charming. Unfortunately, he’s just a frog. But those kisses are the reason he can usually be found at Senor Frog’s during happy hour, telling all the ladies he’s the model for the brand. (He’s not, but don’t let on; it could really kill the party.) He collects kisses and never dissuades the ladies from trying. Pepe believes that all amphibians matter, and for that reason, he is best friends with a number of salamanders, mudpuppies and toads. Pepe sees no distinction. We’re all amphibians, he says. All for one and one for all. Today finds Pepe a bit down in the dumps. Once again confused for Kermit, Pepe signs an autograph, forging a frog’s name that just isn’t his. (Could be worse, he thinks to himself. Last week, a little old lady asked him to sing a Looney Tunes ditty, confusing him for Michigan J. Frog, which was just so embarrassing.) Pepe wishes the masses were clamoring for his autograph the way they do for Kermit’s. Sigh. Maybe someday. Pepe just needs to score his own 15 minutes of fame; but how? Go viral? What are frogs good for but jumping? While he can jump pretty doggone far, 20 times his own body length (not to brag, but Pepe’s length is impressive), he’s pretty sure a video of him jumping will never go viral. Aha! It seems the presidential race is in turmoil. Everyone’s looking for a hero. Why not a third-party candidate with an honest upbringing, shiny green skin, great big trusting eyes, a winning smile … and no horns or tail? Yes! A run for president! Pepe for President. Just has a certain ring to it, doesn’t it? He’ll grab his 15 minutes, and turn it into eight years. (“Four more years! Four more years!”) Ah, to make the White House his home. It already has a swimming pool, why not add a picturesque pond? It will be his first order of business; after allowing equal rights for all amphibians, providing a safe haven for everyone, and getting rid of pesticides. Pesticides? Who needs ‘em when you’ve got frogs around? Previous articleWould You Rather Be Forced To Use A Fanny Pack Or A Pager? Next articleWhich Superhero Sidekick Would You Want To Be?